Mincing no words, French Cardinal André Vingt-Trois told the Christian faithful this week that jihadists “wrap themselves in the trappings of religion” while announcing a “God of death,” whom the prelate compared to the ancient pagan god “Moloch”—who demanded live human sacrifices as a tribute. Earlier in the week from Brietbart: "The Cardinal, who serves as archbishop of Paris, pronounced these words during the homily at a memorial Mass Wednesday celebrated for the martyred priest Father Jacques Hamel, whose throat two Islamic radicals slit during morning Mass this past Tuesday. The Cardinal also said that in the current social environment, fear becomes the driving force behind our choices, leaving people powerless to do good and resist evil. Political correctness imposes silence out of fear of offending, of stepping out of line with the way “proper” people think and speak. REMNANT COMMENT: His Eminence, not generally considered traditional-leaning, seems to be waking up. And for that he is being attacked as a "dangerous homophobe" and "racist" in the French press. He was blasted in social media, by the Green Party, the Socialist Party and even a member of the Union for a Popular Movement, part of the EU's People's Party, for his sermon. This short clip provides a sampling of the expressions of hate and outrage being leveled against the Cardinal after he'd warned not only against radical Islam and the jihad against Christian Europe, but also against the French secularist state's promotion of deviancy and, by implication, the legalization of homosexual marriage. Cardinal Vingt-trois decries the "silence of the elite in the face of the perversion of morals and the legalization of deviant behavior." "André Vingt-Trois Used the Tribute to Jacques Hamel Mass to Criticize Marriage for All?" screamed the headline question on the front page of "Le Huffington Post" and on and on it went, with the Cardinal being crucified for saying exactly what the Cardinal should have said, exactly what most bishops today are too terrified to say, and exactly what the Pope has thus far refused to say. Rather than backing down, the Cardinal has held his ground, even authorizing Vincent Neymon, spokesman for the French Bishops' Conference, to release this statement to the press: "Cardinal Vingt-Trois had the courage to say what he thinks. The subsequent attack against him is further proof of the very point he was trying to make." On the second night of the Pilgrimage, there was more excitement than I’d ever seen as the American chapter of some 65 pilgrims made its way down the steep embankment into the camp. Exhausted and parched after two days beneath a merciless sun, all we wanted to do really was find our tent and fall to the ground. But a throng of French pilgrims blocked our way, their jubilant song rising up before us like the tide at sea. All at once I heard my own name being shouted by several Frenchmen just ahead. As leader of the U.S. chapter I was being summoned. But why? I made my way through the bedlam and soon understood. The Cardinal Archbishop of Paris was standing at the gate, greeting each chapter as the miles-long column of pilgrims entered the camp. Head to toe in traditional red, His Eminence was being hailed like a victorious general by battle-weary troops. as they surrounded their “general”, scrambling to kneel for his blessing as they passed. A few moments later I found myself kneeling at the feet of André Armand Cardinal Vingt-Trois. As I kissed his ring, I recalled that His Eminence is not known for being particularly supportive of the Traditionalist cause in France. 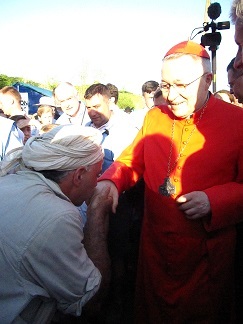 But out of respect for his office and for the opportunity to show their shepherd the true face of Tradition, the organizers of the pilgrimage, Notre-Dame de Chrétienté, had invited the Cardinal to visit the camp that night and offer Benediction of the Blessed Sacrament for the pilgrims. Graciously, the Cardinal had accepted the invitation, and there he was, not in the sanctuary of some elaborate cathedral, but standing in the tall grass beneath the blazing sun, smiling and blessing his dust-covered children. As I briefly spoke to him about what the Pilgrimage means to American Catholics and how hundreds of us over the years have crossed the Atlantic to take part in this glorious event, he smiled warmly and gave me his blessing. Was it wishful thinking on my part or did I detect something in his eyes that bespoke a profound impact of what he saw unfolding before him. After all, only a faithless man with a heart of stone could have beheld that youthful army of Catholics, stretching back as far as the eye could see, their flags and banners snapping in the breeze, the heavy statues of Our Lady carried all the way from Paris on the shoulders of scouts—and not been moved by it. Cardinal Vingt-Trois didn’t strike me as either stonehearted or faithless. I believe what he saw that day made an impression that will not soon be forgotten. Either way, as the sun set and shadows grew long over the Bivouac de Gas, a Prince of the Catholic Church parted a massive sea of pilgrims and made his way to a traditional altar erected beneath the stars. When he raised the monstrance a short while later and the consecration bells sounded across the encampment, ten thousand pilgrims crossed themselves and worshipped God in absolute silence. For that moment at least Christus vincit and the Cardinal’s politics mattered not one iota. The pilgrim army had become little children again, praying at the feet of their father while swearing allegiance to their Mother and worshipping their God. It was as if the revolution had never happened and the whole world was Catholic again. The Cardinal was no longer Vingt-Trois but rather he was Andrew, James, John, Thomas, Philip, Simon and Jude. And the Catholic heart leapt with joy. And now Cardinal Vingt-Trois stands alone in Paris, buffetted by powerful enemies for saying and doing the Catholic thing in a world that is at war with all things Catholic. Any connection between this heroic stand and what happened that day on the Chartres Pilgrimage six years ago? Who can say for sure, but I think maybe there is. Such is the power of God's grace and Catholic Tradition. Let's continue to pray for them all, even and especially Pope Francis, recalling that in the end God will have the last word.